R uth received her Master’s Degree in Painting from New York University and received her B.A. in Painting from Marymount Manhattan College. She enhanced her talents for design and color with an Associates Degree from the New York School of Interior Design. Ruth is currently an Adjunct Professor at the New York School of Interior Design (NYSID). She has been a professor there for more than a decade. #1 for undergradate programs and #2 for graduate in the nation for 2016-2017. Ruth is proud to be working amongst such esteemed colleagues, who has the most ratings on RateMyProfessor.com. In 2005, Ruth established the Ruth Burt Scholarship for students attending NYSID in an undergraduate degree program who shows exceptional promise and creativity. Ruth has an extensive background in both commercial and residential interior design. Since 1979 she has worked with a variety of New York City-based firms including Edward Durell Stone Associates PC, Stuart Mager, Inc., Naomi Leff and Associates Inc., Columbia Pictures Industries, Inc., Mancini Duffy Associates and Jack Lenor Larsen, Inc. 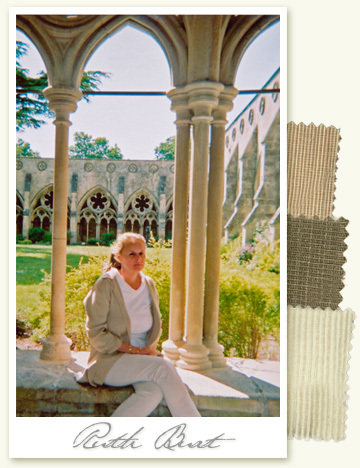 In 1993, Ruth Burt International was founded, specializing in residential interior design. Her extensive client base in the New York, New Jersey and Connecticut region encompasses a wide variety of styles and aesthetics. She works closely with her clients and teaches them how to reflect their personalities and creative spirits in their homes. Ruth's distinctive, elegant style and close interaction with her clients serve to create interiors that are unique and where a sense of the owner is present.